Valtteri Bottas has hinted that his relationship with Williams has been damaged following speculation linking him with a move to Ferrari. The 25-year-old Finn was thought to be a potential replacement for compatriot Kimi Raikkonen, but Ferrari announced on Wednesday that the 2007 world champion would be retained. Williams have an option to extend Bottas's contract to 2016. "For sure it doesn't do any good to my and the team's relationship," he said. Valtteri Bottas is being coy about his future in Formula 1 beyond this year, but the situation is very simple. Williams have a contractual option on the Finn and have every intention of taking it up. Barring unforeseen circumstances, it is simply a matter of time before they confirm he will be driving for them again in 2016. Williams are in a similar situation with Bottas's Brazilian team-mate Felipe Massa, and the team are expected to have an unchanged driver line-up next season. "Nothing has changed for me since the news yesterday. Yes, I have signed a contract for this year, but as for next year we are still in discussion so there is no confirmation about that." 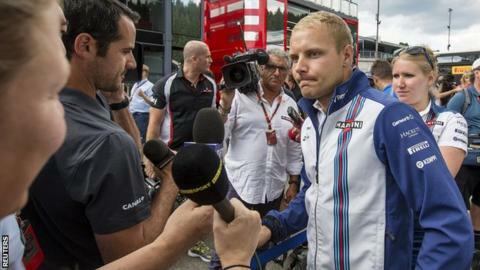 When asked where he will be racing next season, Bottas said: "I don't know to be honest. You should ask Claire (Williams - deputy team principal). Claire is a better person to ask." Bottas, who joined Williams in 2013, is currently fourth in the drivers' championship before Sunday's Belgian Grand Prix at Spa-Francorchamps.